The year 2018 marks the 80th anniversary of the 1938 exhibition ‘Twentieth Century German Art‘ shown at the New Burlington Galleries in London, the largest international response to the National Socialist campaign against so-called ‘degenerate art’. 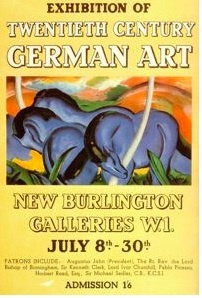 The 1938 exhibition presented more than three hundred works of German modern art by artists facing persecution in Germany – in an attempt to defend them on the world stage. The show, which turned out to be a great success in terms of press reviews and visitor numbers, was also one of the most significant émigré projects of the period. Most of the paintings, sculptures and works on paper – many of which were for sale – had been sent to London by scores of Germans living in exile: collectors, dealers and artists scattered across Europe at various stages of their flight from the Third Reich. The painter Max Liebermann was among the best-represented artists as the exhibition showed at least 22 of his works. His widow Martha Liebermann was also among the lenders to London: she sent Liebermann’s Portrait of Albert Einstein, which was also for sale.